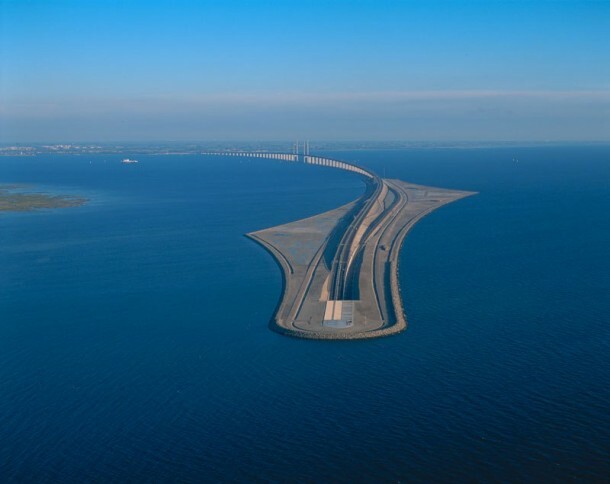 This is Øresund Bridge that connects Sweden and Denmark and is pretty well-engineered apart from being unique. 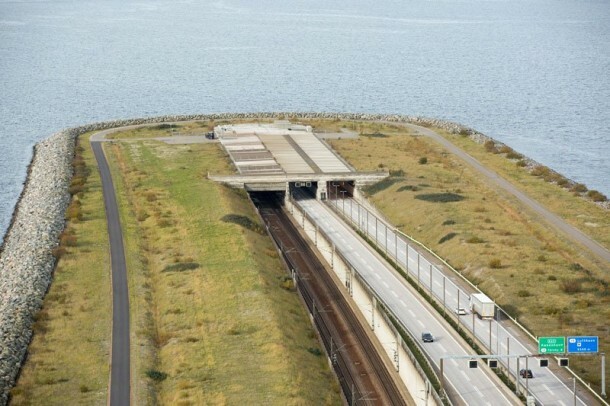 It features a peculiar roadway along with a rail line bridge that runs for almost 8km after which, it transforms into an underwater tunnel for the rest of the 4km. The bridge is open since July 2000. The motorway is also responsible for carrying a huge data cable that is crucial for internet connectivity via Europe. This bridge is, in fact, the longest rail and road bridge in European continent. You might wonder that why would the construction team go to the length of constructing a 2 sq.km artificial island, however, once when you look into the details; it was quite a crucial design choice. The engineering team had to carry out the design and construction of this bridge under a lot of constraints. The bridge was supposed to be wide and tall enough to allow for the large shipping traffic to traverse without any difficulty while being able to provide adequate air clearance for any flight traffic. A sunken tunnel was made to prevent any mishaps with aircrafts. Architect George K.S. Rotne and engineering firm COWI were the main planners and designers for the project. A design competition was held to determine how the tunnel and bridge structure would be constructed. The final selection was that of a cable-stayed bridge in order to provide clearance, meet requirements and being sturdy enough to take the load. The Øresund Bridge construction was quite spectacular as well. Rock and soil had to be dredged from the floor of sea and built up to create the artificial island of Peberholm. Engineers opted for sinking and subsequently connecting 55 million kilogram tunnel segments that rested on a sea floor that had been prepared in advance. Each segment was sealed shut and was dropped into place by making use of a specially designed barge along with 7 tugboats. The cost of the completed project was $4.5 billion and the bridge has some really great improvements planned for the future as well. 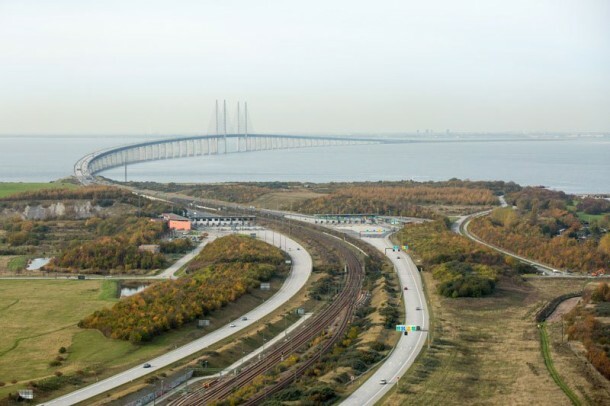 Since a toll has to be paid for crossing the project, it is estimated that the project will pay for itself in 30 years from its date of operation. For the daily required maintenance and inspections on the bridge, there’s a custom designed motorized gantry that works under the railway. It even features a big hydraulic arm that can extend to the road’s surface. During the construction, no dust plumes were produced to protect the surrounded environment. The artificial island has developed an ecosystem that features over 500 species of plants. Although the project is not new but it still renders as a marvel of engineering. 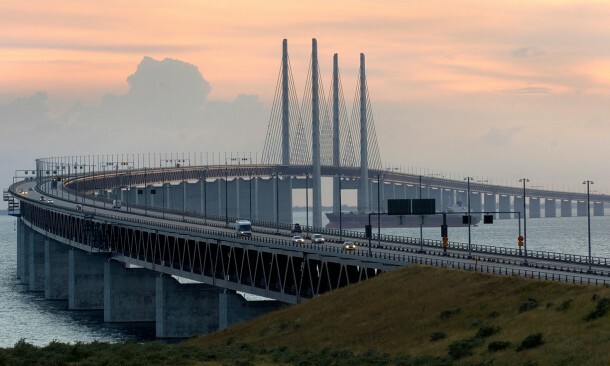 It is one of the 8 bridges in the world that feature bridge-to-tunnel transition and is set apart because of its peculiar design and ability to meet all its requirements in the most brilliant way possible.